If you haven’t seen Annoying Orange in action it’s time for your inauguration because this meme based iOS game is securing a stronghold in app stores worldwide. The somewhat creepy and disturbingly addictive Annoying Orange has formally released his own app and it’s as wickedly satisfying as the web series itself. 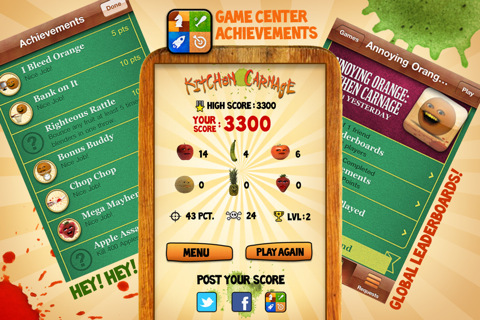 Deemed Annoying Orange: Kitchen Carnage, the game is essentially a Paper Toss knockoff set in a kitchenscape where fruit is slain and snarky comments are a dime a dozen. The goal of the game is to sling different pieces of fruit to their death as time ticks away at the top of the screen. Each piece of fruit, from the apple to the banana and strawberry, have different values and weights, meaning not every finger flick is treated equally in the world of fruit destruction. Successful flings lead various fruits to their demise inside of blenders through oven fans, and on top of cutting boards and only a few successes ensure extra time before the game ends in typical “I must try one more time” fashion. The first method for winning more precious seconds is to shake cupboard doors open and then fling fruit inside but time is also extended when the points bar at the top is filled, leading you into the next level of serial killing fruit deaths. 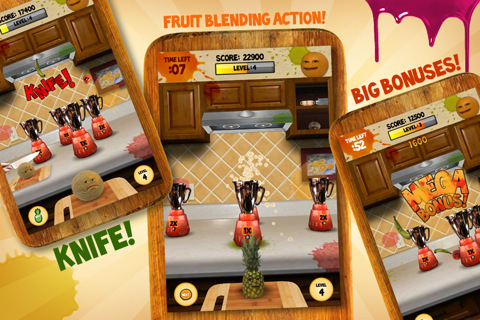 Whatever the case, Annoying Orange Kitchen Carnage is all about slaying as much fruit as possible as blender blades spew blood and knives slice fruits in half. It’s all somewhat disturbing but totally Annoying Orange-like. Odds are that if you like the episodes themselves, you’ll probably also enjoy the app. Although the game is essentially a knock off of all the other toss games out there, the Annoying Orange twist is enough to make it slightly different and probably worthwhile. The graphics are clean and everything about the app interface itself, from the link to the YouTube series to the wonderfully clever talking featured fruit soundbites, makes for a great user experience. 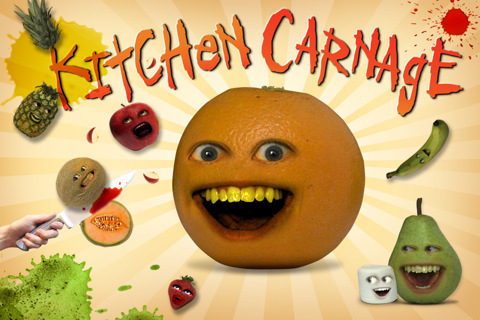 The only thing that really bothers me about Annoying Orange: Kitchen Carnage is the lack of variety. For starters, there’s really no way out of that 2D/3D kitchen where the game is set and beside the fact that new levels bring new fruits, there isn’t a whole lot of advantage (besides points and a chance at leaderboard status) that makes better scores more alluring. The fine text on the Annoying Orange: Kitchen Carnage iTunes page promises a slew of achievements but I have yet to see their benefit. Also, Annoying Orange slides by with a couple choice lines including “Hey! You’re an apple!” and “What’s wrong Banana? You don’t look like you’re peeling very well.” At first both lines are characteristically Annoying Orange, but after awhile it’s just repetitive. Fortunately it’s so easy to turn off specific segments of the sound that this never becomes too much of an issue, but I’d love to see more variety in Annoying Orange’s uniquely humorous dialogue. Bottle Rocket Apps and Daneboe, the masterminds behind the app and Annoying Orange, promise new innovative fruit deaths and more so the dollar price tag will only become more valuable over time. As it stands Annoying Orange: Kitchen Carnage isn’t the most groundbreaking of games but it delivers exactly what it promises: a characteristically (slightly disturbing) extension of the Annoying Orange series. If you love what you’ve seen you probably can’t go wrong. Bottom Line: This halfway disturbing Paper Toss knockoff is clever, addictive and well executed. The only thing Annoying Orange: Kitchen Carnage lacks is more variety.